The local chapter of international environmental organisation Greenpeace took to Brussels’ Rond-point Schuman in the wee hours of Monday morning, completely covering it and surrounding streets in yellow paint. 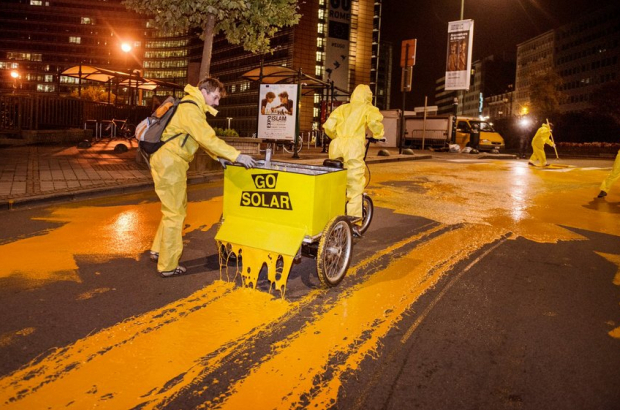 The paint represented the sun, part of a sustainable energy campaign. Member of the organisation then greeted commuters with a giant banner asking the EU to prioritise the switch from fossil fuels to renewable forms of energy. Although the paint was biodegradable and would wash away in the rain, it was causing so many traffic problems that Greenpeace agreed to remove it this morning. What is the base of the paint used by Greenpeace? Is it fully biodegradable?